Abu Mena was a town, monastery complex and Christian pilgrimage center in Late Antique Egypt. It was built in remembrance of the martyr Menas of Alexandria, who died in 296 A.D. 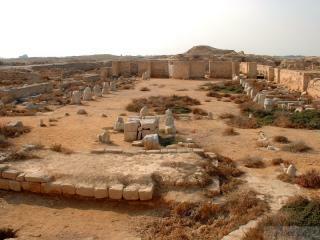 This archeological site is located about 45 km southwest of Alexandria. Probably the most hidden cultural site, tucked behind the new massive Mary church and no sign to indicate it is there. Google map has it as “Old Mary Church” and whereas the site has the correct coordinates too, a review on Google mentioning it is UNESCO made me very sure it is the right place because arriving here is rather shocking. Sure, ruins, but flooded crypts with sludge and trash inside covering what was probably the best part. You really see NOTHING here of value although the local church is still considering it as such, with a new wooden church placed inside the ruins (also seems controversial but whatever). I walked around 7-8 minutes which was already more than enough to see all and be extremely disappointed. A record for fastest WHS visit. I asked the driver from Cairo to make a small detour to see it. Nobody knows about this place, he was shocked to find that this is the place he wants me to stop and not the big church. “Finish? !” It isn't far from Alexandria, maybe 1h. In all honesty if you don't go to see this there is a high chance it gets de-listed anyway. It has been on the In Danger list ever since the World Bank funded projected raised the water level and the crypt is now in the process of being destroyed. One would think they can protect it better but there seems to be no indication of that happening. Judging from the measly sign at the entrance there is really no desire to do so anyway. I am surprised there was a microvan with students visiting. Or you can ask at Saint Mark’s Coptic Cathedral – sometime they organize some kind of pilgrimage tours, mostly for Coptic people, and if they have a free place in the bus/minibus, they can take there. Although this kind of tour focuses on the new monastery. I learnt it from the cathedral. Officially to get to the site you need permission from the new monastery (it is worth to spend there an hour or so and be guided by one of the monks – he will glorify Cyril VI of Alexandria, the Coptic pope who inaugurated the foundation of the new monastery in 1959), where the relics of Saint Mina (and the pope Cyril VI) can be seen. Don’t forget to take your passport/ID with you! You won’t be let in without it. Ask for abuna Thaddeus who is responsible for the UNESCO listed site. We were lucky because on the day we were visiting Aby Mina (more common name in Arabic is Mari Mina), there was a group of history students from Alexandria and we could join them. When we reached the archaeological site (around 2 km north from the modern monastery) we were invited to the small wooden church (on the photo) recently built to shelter the remains of the original altar from the cathedral from 4th or 5th century. There we had a kind of lecture by abuna Thaddeus – it took more than one hour and was divided in four parts: 1. Life of Abu Mena – as a man, as a soldier, as a saint; 2. The old monastery and the town that developed around it – with detailed information about city layout and its buildings, terracotta industry to produce flasks for holy water, roads leading to the site; 3. Archaeological research which started in 1905; 4. Abu Mena as a WHS and the future of this site in danger. The lecture was in Arabic but we had two interpreters just to us, abuna Paolos and a young university teacher who helps the monastery. After the lecture we spend 40 minutes walking around what’s left and using our imagination to see the place at its peak. Thanks to our guides it was not so difficult. The site is partially fenced. There is no entry fee, but you can make any offering or donation. I visited this site in February 2015 on a day trip from Cairo together with a few hours in Alexandria. We first visit the NEW church which is NOT the UNESCO part. This takes an hour to see, it's nice, don't miss it. From there we went to the archeological site which is DIFFICULT to find. Google maps is your friend, it's actually only about 10 minute drive over some dirt roads but they kind of are criss cross but finally we made it. There seemed to be nobody there but we could freely walk it and then someone turned up from the small wooden church there. He asked if we wanted him to show us around, we declined (as we had a Egyptian friend with us who told us to - you know, to pay after which was not agreed). We walked there just over an hour. The underground things are mainly filled with sand/water. There is some restored parts and you can clearly see all the foundations. On my blog you find some pictures. Its worth the visit especially if you like UNESCO sites. i would not recommend the regular traveler to go there. 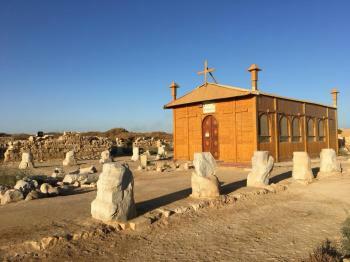 The eerie silence at Abu Mena adds to it's mystique but the absence of visitors isn't reflective of its history as a major place of Christian pilgrimage. 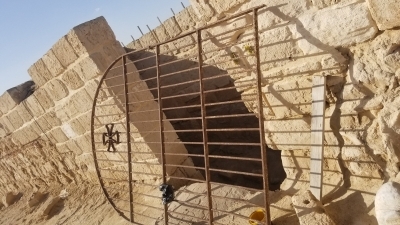 The site remains sacred to the Coptic Orthodox Church which is the guardian of the site. Through contacts in the Church I was privileged to get a guided tour in October 2008 but otherwise it's off limits for good reasons. The damage caused by the World Bank funded irrigation project is very evident with the crypt still submerged under water. If you do have an interest in early Christian history, it's well worth looking in to. Abu Mena is not an easy place to visit. It's about 90km West and a bit south from Alexandria. You have to take a taxi which should cost about US$20. The monastery is huge with lots of buildings, a beautiful basilica that is currently being restored. The current Egyptian craftsmanship is far better than anything else being done in the country right now. The ancient monastery archaeology site is off limits to tourists and is virtually impossible to even find on your own. There must have been 2,000 people at the monastery when I visited in September 2004 but I couldn't find one who spoke English, Spanish or French. The ride itself, out through the desert and past a huge abandoned industrial park is worth the trip alone. Take bottled water - none is available at the monastery. St. Mina was an interesting guy. This is the site where the camel carrying his body to burial stopped. A healing spring miraculously started here and many pilgrims came for healing.